He’s also kept a low profile as Trump’s rise has spurred curiosity about the Kushner family. 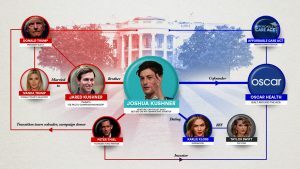 Through a spokesperson, Josh Kushner told Esquire magazinebefore the election that he has been a Democrat his entire life and would not be voting for Trump. The spokesperson also said that Josh Kushner loves his brother and did not want to say anything that would embarrass him. This article is reproduced with permission from STAT. It was first published on Nov. 17, 2016. Find the original story here.